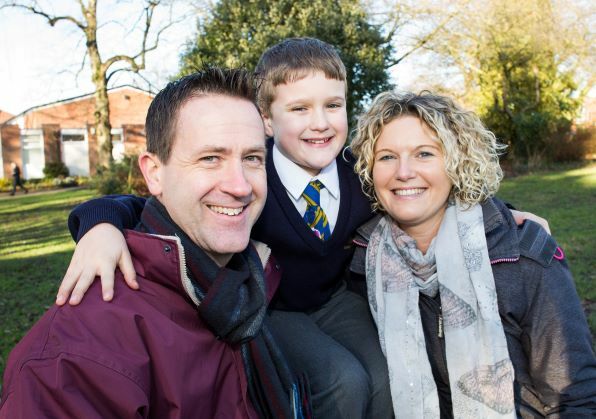 When Mike Bradbury was awarded the accolade of Home Instead Senior Care’s CAREGiver of the year, his son Thomas (9) was so proud that he told classmates he wants to be a carer when he grows up, just like his dad. Mike (45), from Marple Bridge in Stockport, was awarded the prestigious title of Home Instead Senior Care’s CAREGiver of the Year in an emotional ceremony at Home Instead’s recent national conference. The home care franchise company employs over 9,000 CAREGivers and Mike was honoured as the year’s number one for going above and beyond to provide friendship, as well as personalised support, to elderly clients in his community. Not only does his son Thomas now want to be a CAREGiver, he also gave a presentation to his class that described his dad as the best CAREGiver in Europe, upgrading him to an international title! Mike who, along with wife Sarah, also has three daughters, began his career as a joiner. After realising that the role left him unfulfilled, three years ago he took the bold step of reinventing himself as a CAREGiver. Of his career change Mike said, “Many people ‘of a certain age’ choose to stick with the path they’re on, even when they’re not happy, but I knew that helping other people would help me just as much. I took the leap and joined Home Instead. Now I give a lot of myself but in return my clients inspire me and I look forward to every day. Mike is known for meticulously researching the needs and preferences of his clients, so that he can do things just the way they like them. When one elderly gentleman expressed that he preferred a wet shave to an electric razor, Mike bought the equipment and practiced on himself until he was good enough to give his client the shave he wanted. He’s learned other new skills as well, including cooking a fantastic fish and parsley sauce and painting with watercolours, all so that he can help his clients continue to share the things they enjoy. Home Instead CAREGivers spend a minimum of an hour with each client and this policy has enabled Mike to develop real friendships with the people he supports.